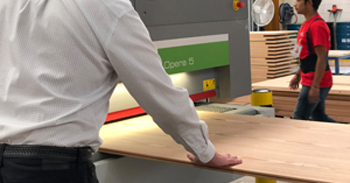 To provide assistance to manufacturers, Biesse’s experts share their knowledge and tips on how to solve some common issues facing today’s manufacturers. Below, Biesse America and Canada’s Product Area Manager for Viet Sanders, Antonio Cucco, shares 3 tips on how customers can achieve proper material removal during calibration. Maybe the task at hand is applying veneer to an MDF or plywood board. Or maybe someone needs to make sure a cabinet door that’s been glued is perfectly flat. Either way, achieving perfect thickness all over the part depends on several factors being precisely right. If you experience problems with sanding and finishing, here are some tips that could solve them. TIP ONE: It’s crucial to use the right abrasive. Problems can arise if you use too fine a grit and remove too much of the wood material as the abrasive spins around the drum. At the end of the process, you will see that your part is uneven. You might also notice a depression in the woodfiber, which impacts the way the stain or sealer absorbs and causes color inconsistency. TIP TWO: Your problem could also be related to the hardness of the drum. If the drum is too soft, it does not operate as aggressively as it should. The drum can remove too much wood in places where the fiber is softer and too little where it is harder. Again, whether you are using a steel or rubber drum, you need to make sure you are using the right abrasive. As a general guideline, for example, if an operator wants to remove .030” of material, it is recommended to begin by calibrating operation with 80 grit abrasive. TIP THREE: Another tip is to adjust the speed of the conveyor. When you slow down the conveyor speed, you give the abrasive more time to remove material on the part. The solution in each quality situation is closely tied to your investigation of the problem. If a part comes off the line uneven or with stain absorption that’s not optimal, think it though, consider these tips, make adjustments, and run the calibration operation again.